I like cows. Not to the point where they become holy, but there is something magnificent about such a huge beast with incredibly expressive eyes. And they make fabulous car seats. My experiences with leather seated cars have not all been happy. There was the sad story of the 1949 Peugeot 203 with leather seats that I owned – all too briefly – in the 80s. An early model, in splattered black, with suicide doors and a sunroof (oh wherefore art thou now old Pug?) I bounced around everywhere in those torn leather seats until one day the gear linkage came adrift in rush hour gridlocked traffic. Still in a suit and tie from work, and on my way to officiate at a function to be addressed by the then Premier, I arrived only slightly late and lightly and somewhat endearingly covered in grease, oil, gravel and sweat. The Premier was suitably impressed when I explained that I had to conduct running repairs involving paper clips and rubber bands on the side of the road – such was my determination to get there. All was forgiven. And the car was promptly sold for something – marginally – more reliable. Then there was the glorious Karmann bodied coupe – a 1974 BMW CSi in original factory cream hide. The leather was an expensive optional extra, so I was aghast upon selling it to be told by the buyer that the first thing he wanted to do was have it retrimmed. "But it is original and in perfect order" I protested to his uncaring ears. He also removed the five speed Getrag conversion to re-instal the original four speed [wasting $4k of modifications that improve the car a thousand fold] and then promptly on-sold it at a loss having never driven it. And the now departed Jaguar E type – sellers remorse has hit – had glorious original red leather that was somewhat the worse for wear. 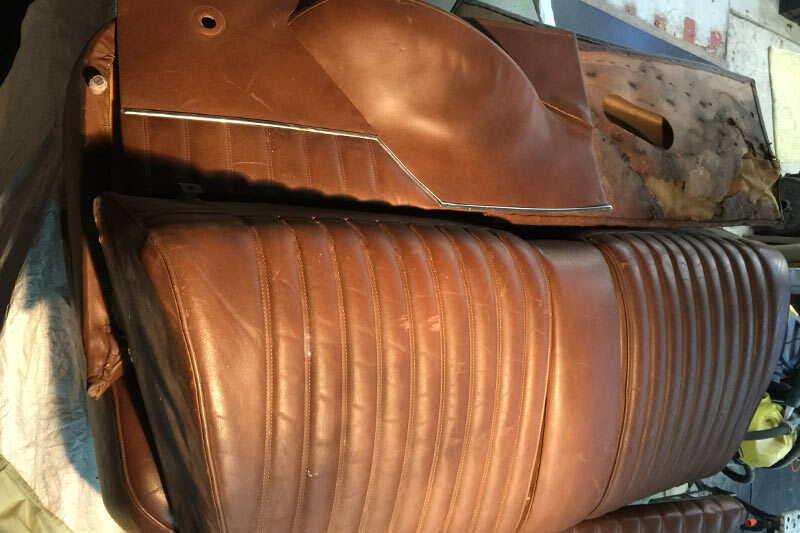 A genius trimmer rescued the driver’s seat with invisible canvas backing, taking the strain off the stitches away from the ageing leather and instead putting the stitches into the canvas behind. Brilliant. 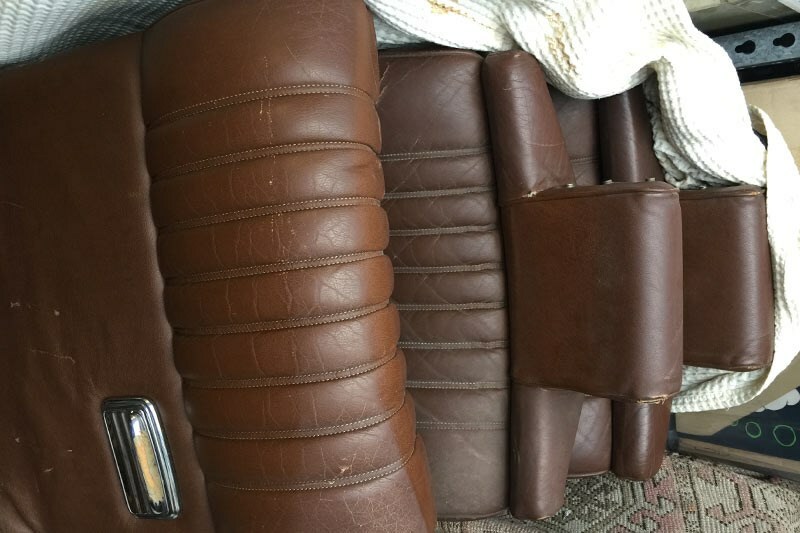 Invisible mending, and saved the indignity of a new seat on one side not matching the old seat on the other. Or just two new seats in front plus old back and sides and door cards and so on. Once you start, you have to keep going. Saved me squillions and preserved the story of the car, the integrity of the history. So now to today’s dilemma. I have a rather swell looking 1974 Citroen DS23. The previous owner spent a lot of money on a total retrim, replacing all the faces on all seats front and back and all four door cards. Grey velour, matching the original pattern – and very professionally done. But it is not proper. There was no such option from the factory. It offends my eye every time I see it. Velour came in several tones, but never grey. The original pattern leather trim kits from Europe cost around $10,000 all up. Add on GST for such a big transaction and freight and the trimmer fitting them professionally. Best guesstimate is at a total of $15k ? Not worth trashing a perfectly good but not period correct set of newly trimmed velour for such a huge bill. And spending that money does not add matching extra value to the car in any way. So imagine my delight when I spy an ad for a full set of patinated and bruised leather for the same model offered for sale locally. 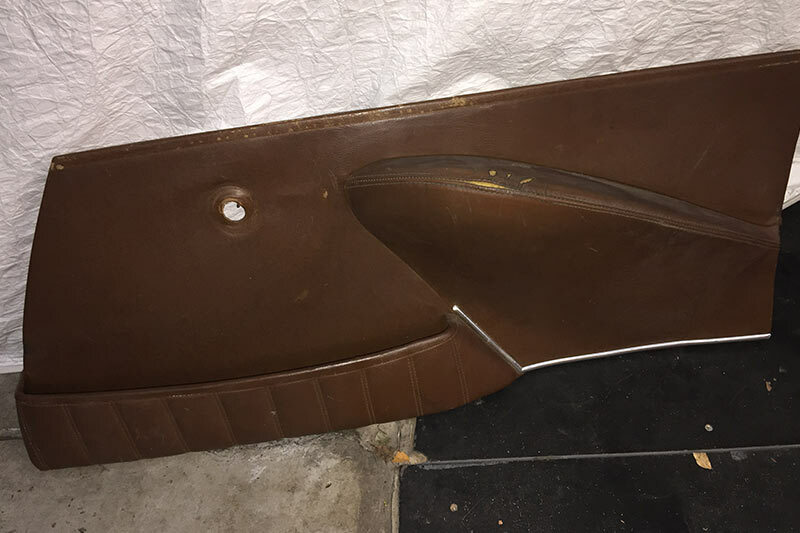 Four door cards – damaged but salvageable – and front and back seat uppers and bases. For a very reasonable amount, requiring no doubt some repairing and fettling. Snap. 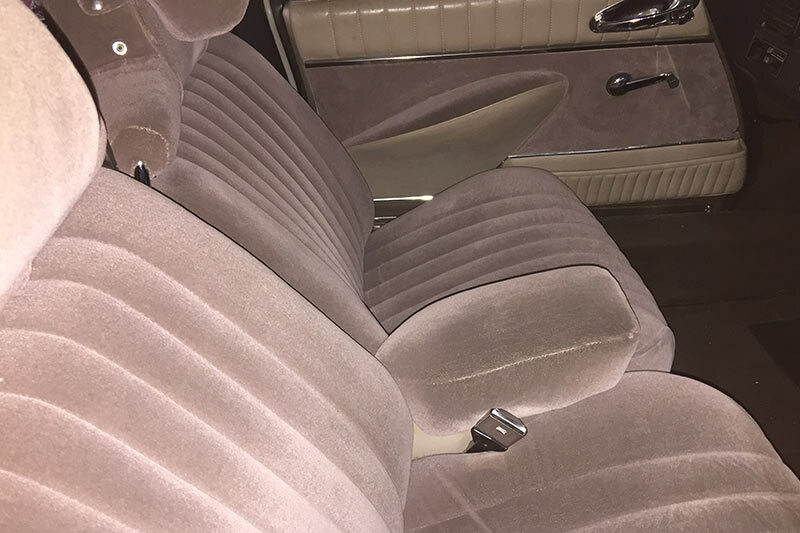 The only item missing is the impossible to find central arm rest in matching chocolate leather. Maybe in Europe? the USA? If I am patient, I tell myself, one day something will come up. And then, just last month, an eBay seller in South Australia is advertising the exact missing link, in leather , matching colour and all. An email of an offer too good to refuse – $100 if you must know – and it is bubble wrapped and in the post in a jiffy. Now my set is complete and I can now go and annoy the trimmer. And my DS23 will look and feel as it should. Anyone in the market for a set of almost new grey velour DS seats and door trims?